Kitchen and bath remodels tend to be a big investment for our clients. Balancing timeless, quality design with home trends is the key to a successful project. With the growth of social media over the last decade, it is overwhelming for our clients to make sense of their Houzz look-books, Pinterest pins, and never-ending Instagram feed. They rely on our expertise to help them visualize the big picture, while incorporating design trends they are gravitating towards. Today's Kitchens and Baths are focused on combining interesting materials -giving a fresh take on transitional style. Below are our favorite elements playing into that theme. PAINTED AND COMBINATION CABINETRY: Homeowners have been told for years that one of the easiest ways to freshen a room is to paint the walls. Now we are seeing this tried and true concept flowing over into cabinetry. We are choosing strong and bold paint colors in addition to the classic white, and even combining multiples throughout the space. Behr has caught on, with their color of the year: Blueprint. QUARTZ COUNTERS & WOOD ACCENTS: We're saying goodbye to busy patterns of granite and ushering in the more solid looks of marble and quartz countertops. We are seeing wood accents being incorporated throughout spaces on more than just floors. Butcher block countertops, reclaimed wood walls, and open wood shelving are having a major moment that is due to stick around for a while. TILE PATTERNS, CEMENT TILE & RUGS: Talk about a wow factor! Even simple tweaks like laying subway tile in herringbone patterns elevates interest. Bold geometrics are emerging everywhere. We're installing tiles as accent walls in bathrooms, kitchens, and bars. If a homeowner isn't ready to commit to tile, another impactful option is choosing a bold rug -bonus, this is also very on trend! (Same concept as adding playful patterned pillows to a solid sofa). GOLD, BRONZE, & MIXED METALS: There is no longer one right answer when it comes to choosing a hardware finish. The dated "only one metal" rule is gone, opening the ultimate opportunity to mix and match within a space. Its been as freeing as when we moved past the "no white jeans after Labor day" rule. Layering a space with metals that work together in harmony, but add the interest of juxtaposition to a space is our goal. Gold hardware and plumbing now combine with stainless appliances with ease. This trend is actually becoming the new classic. SHIPLAP, OPEN SHELVING, WALLPAPER: Whether adding texture with shiplap or pattern with crisp wallpaper, we're finding the walls a prime opportunity to add interest to any space. Elements like open shelving offer an even bigger opportunity to layer in design elements through functional and decorative accessory displays. 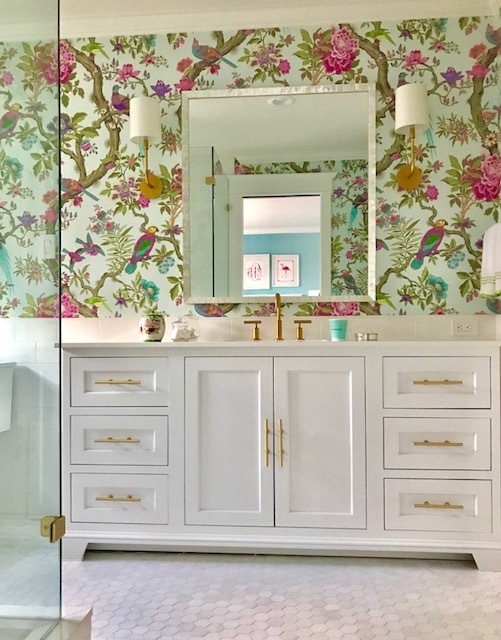 We love to add fun wall coverings especially to a powder room, letting your personality shine for your guests, while you aren't staring at the pattern all day.